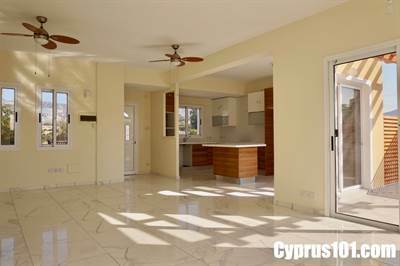 Home »Coral Bay»Villa in Coral Bay – Suitable for Permanent Residence Scheme – Walk to the Beach! This stylish three bedroom property is located on a quiet residential cul-de-sac in the popular holiday resort of Coral Bay. Amenities are all within walking distance including a large supermarket, restaurants and bars. The fabulous sandy beaches and sparkling waters of Coral Bay are only a few minutes’ away. The property offers a unique opportunity for those seeking permanent residency through the fast track scheme to have a fully completed home with title deeds, without having to purchase off plan. The accommodation is spacious throughout with good quality finishes and there is potential for further expansion, should a fourth bedroom or additional room be required. The ground floor features an open plan living room with large lounge, formal dining area and contemporary style Italian kitchen with central island. Sliding patio doors lead to a private terrace with wood pergola and screening overlooking the expansive gardens and pool leisure space – a perfect spot to enjoy your morning coffee. Off the living room is a double bedroom with en-suite facilities, guest w.c and staircase leading up to the first floor. Feature picture windows flood the upper hallway with light as well as offering fantastic mountain views. The master bedroom with en-suite bathroom is particularly light and spacious with windows on three sides. Sliding patio doors provide easy access to a terrace with stunning panoramic sea views shared with bedroom two. Being a 1000 sqm plot this property enjoys plenty of outdoor leisure space including a beautiful mosaic tiled swimming pool and surrounding sunbathing terrace. To the side is a large gated driveway with space for parking several cars. This is certainly a wonderful opportunity to put the finishing touches and transform what is currently a blank canvas into a luxury residence and/or holiday home.